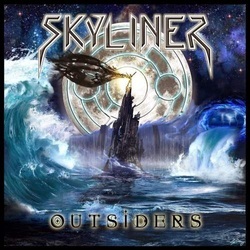 Skyliner has been around for quite a few years in the Florida area now, but this is their first full length album thus far and they must have taken their time on putting out something pretty special as it really does shine brightly! After a two minute intro of sorts, Symphony In Black comes across and boy does that track really deliver! It is a non stop seven minute strike right at your soul with a blazing fury of pent up metallic rage in a progressive power metal vehicle! In other words, it really rocks!! If I was to use two words to best describe the sound of this very high quality CD I would say "caged intensity". At times it feels as if there is a thrash band contained within the power prog maestros that are Skyliner yearning to break free. Even in the mid tempo songs you can feel it bubbling up under the surface. This energy really helps make this CD a success. Many times when you listen to some power prog it sort of just meanders along through some really well written but rather boring tracks, not so with Outsiders. Even the softer moments are written with a good dose of the drive and energy in them, making this a very good listen all the way through. Normally when a CD has songs that average between seven and eight minutes in length I cringe as I start to worry I may begin to nod off somewhere in the middle, fortunately though Skyliner have found the solution to the problems of the space time continuum as the songs seem to zip by rather quickly. The twenty minute album closer notwithstanding, but more on that in a minute. The Human Residue, Dawn Of The Dead and The Alchemist really nail down the back end of the CD and keep things shining through showing the band didn't stack all their chips on the top end either. In fact if anything I think it really gets stronger as the CD goes along. The mix really does go a long way into keeping you into the CD and if you don't feel like trekking through the ending epic at least it's at the end. As far as epics go, when a track hits the ten minute or so mark I usually give it a cursory listen and then move on, my ADHD rarely let's me get through them (though there have been some exceptions). I checked this one out and it is quite good, but I don't see myself really diving into it very often unfortunately. After 14 long years since the band's formation Skyliner has put out one hell of a sweet full length release. Pat yourselves on the back fellas, you have done a great job! But don't spend too much time doing it as we want to see the second one come along much sooner than that!